There’s nothing quite like Mom’s chicken soup when you’re sick. 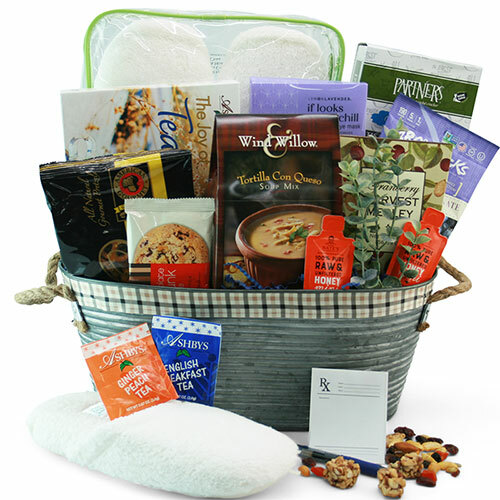 She always knows just what you need..with that said, we’ve prepared a Mom approved get well gift that’ll do just that! If you would like to further personalize or customize your gift, you may select Add-Ons from any of the following. Incremental charges apply. Optional add-on selections. Additional charges apply as displayed. IMPORTANT NOTE: These are 9 in. Mylar Foil Balloons and may only be delivered via FedEx Ground shipping or by Local Courier. Balloons will deflate during FedEx 2 Day, 3 Day or Overnight Shipments. If you add a balloon to any expedited shipment, it will be refunded. Let us know the occasion and we’ll gift wrap accordingly! VERY IMPORTANT: Be sure to include the recipient’s name, your message, and who the gift is from (i.e. Karen, We hope you get well soon! Best Wishes, The Allen Family). If you would like to add a special message on imprinted ribbon, please select your ribbon color preference and then type your personalized message in the box below. This is an optional upgrade and will add $7.95 to the cost of your gift. Enter Ribbon Message Below (Limit 45 Characters Including Spaces). When Would You Like This Item Delivered?